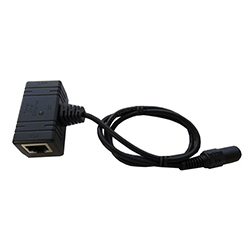 The POE-INJ-1000-S is a shielded passive power over Ethernet inserter that is compatible with data speeds up to 1 gigabit. The DC connector is shrouded to ensure a more reliable dust free connection. The shroud also adds mechanical friction to prevent the mating connector from disconnecting accidentally. The RJ45 connectors are shielded to ensure continuous shielding from power source to destination device. Power is supplied on Ethernet pins 4,5(+) and 7,8(-).